Sem-Synthetic coolants from Buckeye Lubricants include 10-24 and TLSG-320-24. Buckeye Lubricants manufactures a number of semi-synthetic metalworking coolants and the more popular ones are detailed below with links to data sheets for each one. Buckeye 10-24 is a superior ALL-PURPOSE product suitable for almost all machining & grinding applications with virtually all materials. 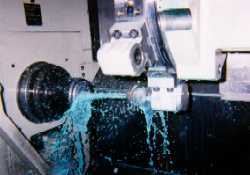 Buckeye TLSG-320-24 is an outstanding machining and grinding coolant for all applications and it is particularly effective on difficult alloys.